My first thought when approached with the subject of Creating Your Sanctuary was “easy peasy, I’m a designer at McCready Interiors, I do that for clients and customers every day”. I ask many questions to find what they want their environment to reflect, then select styles and fabrics or leathers that will be successful in creating that feeling. A sanctuary is a place of refuge, a place of safety, a place to retreat, it should reflect whatever brings you a sense of peace and tranquility. In reflecting and researching for my blog, I considered that my personal sanctuary actually changes quite often. My home is obviously a sanctuary where I retreat at the end of the day, but I soon realized I have many opportunities for a sanctuary; a walk in the woods, my gardens, a yoga class, even a visit to the home of my best friend since high school to enjoy the hot tub and catch up. Your sanctuary may be the beach, an exercise class, a girls night out, or a space in your home you can make your own. It could be those moments when you have the opportunity for “no boys (or kids) allowed”, a big comfy reading chair or a place you can have quiet time to reflect, meditate, or just slow down to recharge. As women, many of our lives are centered around taking care of others; we are nurturers, caregivers, helpmates. We tend to do for others before taking care of ourselves. When we give our all to everyone else, there is little left for ourselves. The importance of self-care is critical to our well-being. We must take the time to regard ourselves highly enough to carve out time and space to enjoy a sanctuary of our own. Creating your sanctuary is simply making a space that gives you the opportunity to surround yourself with an area to take a breath and unwind. If you are able to start with a blank slate space, select a wall color that reflects calm to you. Select pieces that avoid clutter and chaos, keep the space simple. This is an area you want to be able to completely relax in. Carefully edit what you place in your sacred space, less is usually more when you are looking for a place for quiet or meditation. If nature brings you calm and joy, place greenery or nature-inspired artwork there. Position your comfy reading chair facing a window so you can enjoy the view. If the beach is your sanctum, use colors that reflect the sand, sea, and sky. Surround yourself with beauty and an atmosphere of calm. Turn off the TV and turn on your favorite music if you don’t want silence. I have many Pandora stations I can select from to enhance whatever mood or feeling I want to focus on. I choose Motown if I want to escape and maybe dance a little (when no one is watching), Glenn Miller if I’m feeling nostalgic, Eric Clapton or the Beatles for a variety of reasons, and slow smooth jazz or classical choices to for a quieter environment. Candles whether real or the real-looking battery powered styles can set the mood with soft lighting. Many of us have essential oils and diffusers to provide soothing scents to help create the perfect environment. When we make time to devote to ourselves and nurture ourselves, we become our better selves. A sacred space is a perfect place to let our best selves shine through. 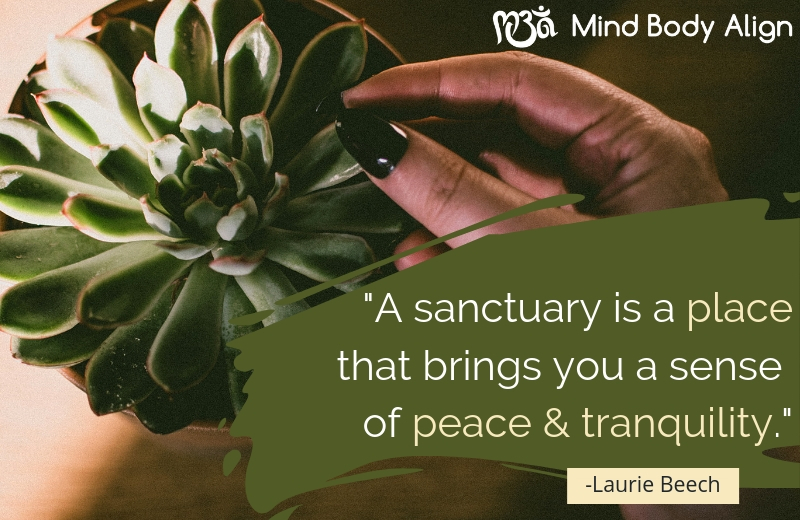 Creating a sanctuary isn’t difficult. Just remember to keep it reflective of who you are and what kind of energy you want it to invoke. 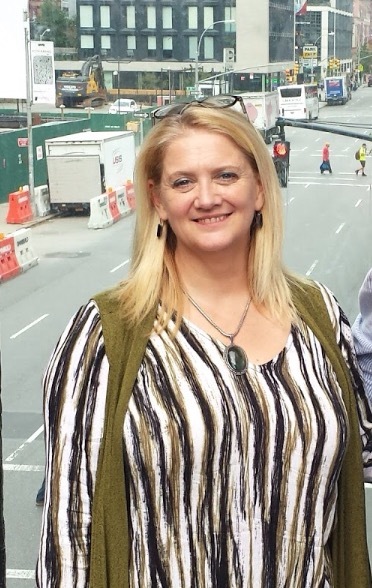 Laurie Beech has been a designer at McCready Interiors for nearly 18 years. She and her husband Tom have been married for 31 years and have no children. They purchased her grandparents home when they got married and she is 4th generation in that home. She has seven nieces and nephews and six great nieces and nephews that she loves spending time with. Laurie is treasurer of the Ashland Chautauqua Planning Committee, a past vice president and current board member with the Mansfield Referral Association and volunteers with Young Eagles, an organization that gives children 8-17 free airplane rides. Laurie, thank you for sharing your insights. I agree about “turning off,” we are often overloaded with external and internal stimuli. Turning off takes practice, but reaps calming rewards.